Get those Harleys ready for the December 5, 2010 Street Bikers United Toys for Tots parade in Honolulu, Hawaii. Four to five thousand riders are expected to make the four mile route beginning at Magic Island and ending at Kapiolani Community College. Participants from several Hawaiian Islands, Japan and other counties are expected. The event is sponsored by Street Bikers United Hawaii and advanced registration is not required. Gates open at 7AM and the ride begins at 11AM lasting about an hour .All motorcycle riders and their bikes are welcome. A $2 donation is requested to help defray costs for permits, traffic control and insurance. I spoke to Ray Pagon, State Treasurer for Street Bikers United Hawaii. He asked me to remind riders to be considerate of our neighbors and tourists alike. He encouraged riders to obey all speed limits and discourages revving engines to reduce complaints. This ride brings in over 10,000 toys to boys and girls and he does not want to see the event closed down. For more information, contact event manager Ray Pagan. Here is a look at last years parade: 2009 Toys for Tots Biker Parade Waikiki. Not I, is an official selection of the Hawaii International Film Festival for its 30th season held at the Regal Dole Cannery Theatres. On Sunday October 24th at 2:15pm, Not I will screen as part of the Pacific Panorama Shorts, and it is also nominated for the Best Local Shorts Award. Written and directed by Misa Tupou, Not I ventures into the world of a violent man. Or is he? From a deep sleep he awakes to discover an abusive act on a woman. This forces him to choose, whether to help or not. His indecisiveness mirrors a familiar reality that perhaps he has lived this moment from a previous life. Is it déjà vu, a dream or is it real? 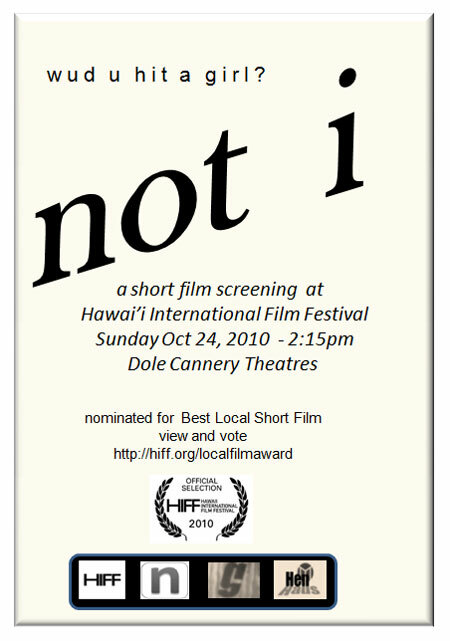 For interviews or more information about “Not I” please contact Misa Tupou directly at 808-721-6942. Hyatt Regency Waikiki Beach Resort and Spa, in partnership with Make-A-Wish Foundation of Hawaii, invites the public to register for the Fourth Annual Swing for Wishes golf fundraiser. The tournament is Thursday, October 14, 2010 at Hawaii Prince Golf Club in Ewa Beach. Registration is $749 for a team of three players and $249 for individual entry. Fees include: green fees and cart, lunch, post tournament dinner, welcome gift bag, and a raffle ticket. All contestants are eligible to win a 2010 Honda Fit Sport from Pflueger Honda. The goal of the Make-A-Wish Foundation of Hawaii is to make dreams that seem impossible come true for young people diagnosed with life-threatening illnesses. According to Make-A-Wish Foundation of Hawaii, approximately fifty wishes are made each year. With the help of the annual Swing for Wishes golf tournament, Hyatt Regency Waikiki Beach Resort and Spa has been responsible for fulfilling the wishes of at least twenty-five children in three years. To register for the golf tournament, please call (808) 237-6105 or email swingforwishes@hyatt.com. Additional information and event updates available online at swingforwishes.com.